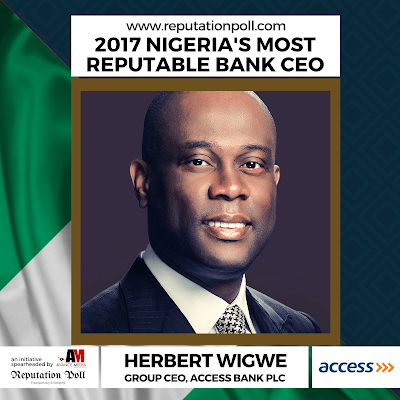 Herbert Wigwe, Group CEO of Access Bank Plc has been voted the Most Reputable Nigerian Bank CEO in the latest ranking poll of Reputation Management Agency, Reputation Poll with leading PR and Rating Agency, Avance Media and the Institute of Leadership and Management after beating competition off from other 19 CEOs of commercial banks in Nigeria in a public poll. The 50 years old CEO, since assuming office in January 2014, Mr. Herbert through very challenges have been able to keep the head of the bank high in the industry. Herbert who is also an Alumnus of the Harvard Business School Executive Management Program served as the Chairman of Access Bank Ghana Limited and is the current Chairman of Access Bank (UK) Limited. 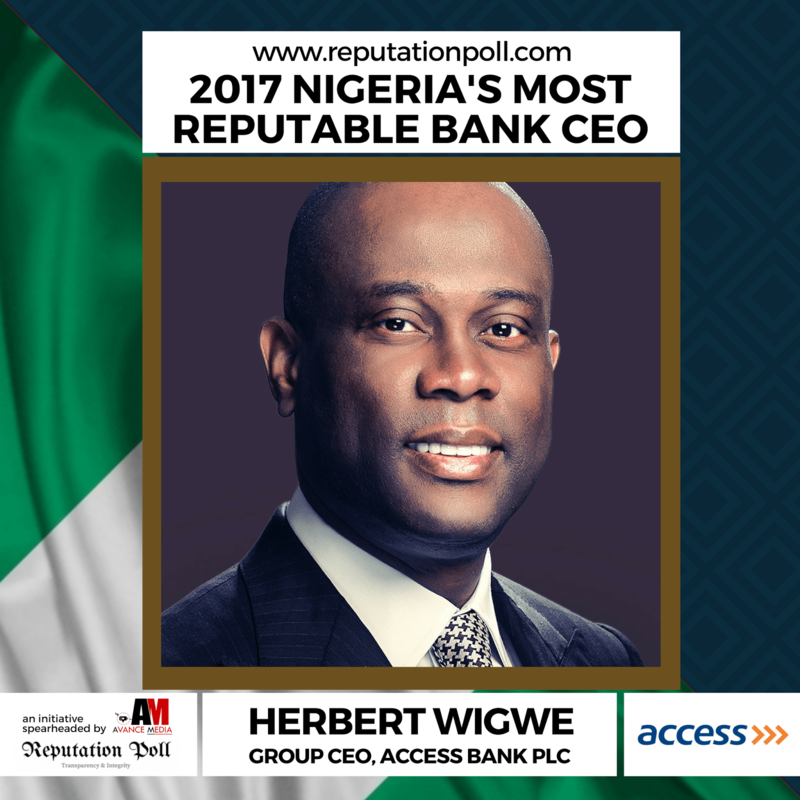 The poll which is been undertaken across various countries, recently had his Ghanaian counterpart, Dolapo Ogundimu, CEO of Access Bank Ghana also been voted the 2017 Most Reputable Ghanaian Bank CEO. Forbes ranked entrepreneur and founder of Reputation Poll, Barr. Rex Idaminabo in a short statement admonished the leadership of Mr. Herbert Wigwe in the Nigerian Banking Industry as endorsed by the participants of the public poll and asked he and other CEOs create very easily accessible platforms where they can mentor young Nigerians to become very diligent in business. Reputation poll is a South African research-based, global performance-management consulting company. Avance Media is Africa’s Leading Media and Public Relations Agency focused on creating varied contents for the Global Market.